Hysterectomy is a well-established and thoroughly effective treatment for fibroids, removing them for once and for all. Women for whom fertility is no longer an issue, may wish to consider hysterectomy as a definitive procedure even though more invasive and involving a longer recovery time than some of the newer treatments now available. Various types of hysterectomy (abdominal, vaginal and subtotal) are available and ovaries are not routinely removed unless there is a good reason to do so. At the Birmingham Fibroid Clinic we understand that many women considering hysterectomy wish to look into all the alternatives available before making the final decision and we are here to support you with impartial advice on which treatment options are open to you and which is likely to give the best outcome in your particular situation. 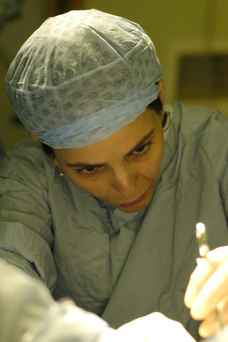 For many women hysterectomy may well be the best choice and should you choose to go down that route, or indeed any other surgical procedure, Shirin Irani offers surgical services at the BMI Priory Hospital and at Spire Parkway Hospital.